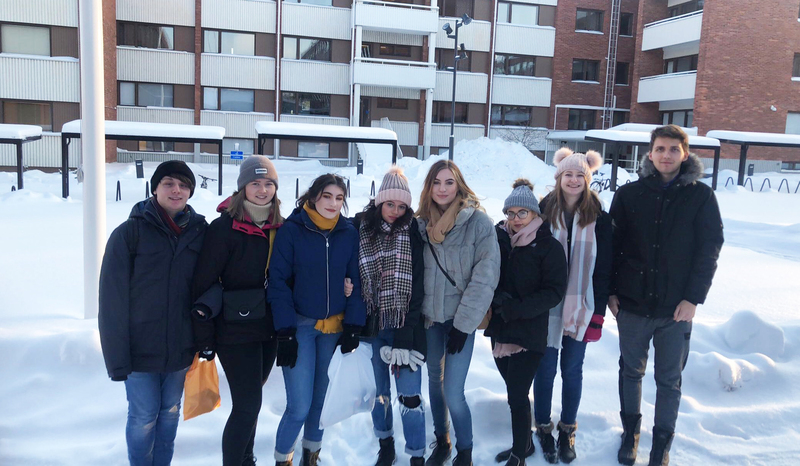 A Level students from West Nottinghamshire College have just returned from a week of fact-finding and knowledge sharing in Finland. The visit to the Jyväskylä Educational Consortium (JEC) Gradia, Finland, saw eight students discovering more about how to build resilience and avoid stress during their studies. This project was first explored in 2017 when representatives from JEC and the BBS Osnabrück-Brinkstrasse in Germany, visited the college, and has been funded by the European Commission’s Erasmus+ programme. It was initiated by academic studies staff at West Nottinghamshire College. ‘Addressing Exam Stress and Improving Performance Under Pressure’, came about due to an increase in the additional support being made available to students suffering from anxiety, particularly linked to exam pressure. The objective was to identify and implement strategies at the point of enrolment and on-programme to build resilience in order to develop a more self-assured student and to engage with students to develop appropriate student-centred approaches. Last week’s visit to Finland saw West Notts students involved in a variety of workshops and presentations relating to exam and study stress and working on a social media project to help combat these kind of pressures. Students were set the challenge of creating online resources which would support students in managing their exam stress and sharing it in order to get the most interactions. Student Abbey Standring received over 900 interactions in two days on social media for her ‘Hierarchy of Urgency’ resource which supported students to manage their time better. They took part in a ‘stressful situation’ demonstration and a session about how to avoid stress, led by Finnish teaching staff and social workers. Both students from the UK and Germany were able to compare their educations systems with the Finnish students and presented their findings to the JAC students. Learning by ‘doing’ was another workshop enjoyed by the visitors when a young entrepreneur company showed the Finnish ways of avoiding stress. Staff and students enjoyed a period of shadowing in the classrooms and took part in a range of lessons. Tutors shadowed progress mentors and saw how tutorials were delivered, preparing students for their final exams. By individualising their programmes of study it enables some students to finish their qualification quicker than average. “The visit provided many new experiences which meant students were often quite anxious before many of the planned activities. However, using the benefit of hindsight they recognised that they were well-equipped to manage their performance and they needn't be so anxious. The visit meant students were more confident and prepared for future situations which is exactly what we hope to achieve in relation to their final exams.